What would your life look like if you truly enjoyed the journey? 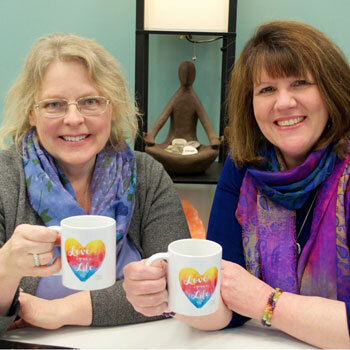 In this show, Genie and Debi and their guests will share some time-tested, evidence-based tips, tools and tidbits that can help you live a happy and meaningful life! They will talk self-care; they’ll talk appreciation; they’ll talk life, love and more! Join the fun while you live, laugh and love your life! Each week you will have a chance to call in to share your thoughts, ideas and questions. You'll get down-to-earth, practical advice and tools to use that will set you on your path to really and truly loving your life! You deserve love, joy and peace. Walk together with Genie and Debi enjoy the journey of life! Genie raised two smart, talented and resourceful daughters while recovering from a diagnosis of leukemia. Back in 2000, faced with a scary diagnosis and the prognosis of 3-5 years to live, Genie used the tools she writes about and teaches to bring herself back to a state of health, happiness and joy of living. As a coach, Genie uses her life experience and resources to help her clients create lives they love! Genie Lee Perron is an ICF certified Life Coach, PCC, Certified Health and Wellness Coach, Licensed Heal Your Life Teacher and Coach. Genie had the privilege of studying directly with Louise Hay, founder of Hay House Publishing and with Dr. Patricia Crane, founder of Heart Inspired Presentations. Genie has studied positive psychology with Martin Seligman and his colleagues at UPenn. She is the owner of the Love Your Life Center of Plymouth in Plymouth, Massachusetts. She is a published author whose first book, “Things I Wish my Mother had Said … (or maybe she did)”, was an Amazon and Barnes and Noble Best Seller for 8 weeks. Genie has coached people worldwide as a former coach for Summer McStravick’s M.E .School Flowdreaming Program. She holds a Bachelor of Science in Education and is passionate about learning and sharing her knowledge and life experience to empower others to change their life by changing their perspective. Debi Filippi is an Independent Parent Educator, Certified Presenter for the TranZed Institute and Professional Certified Coach. She practices a holistic “whole person” approach to parenting and coaching, trusting each brain is as unique as a fingerprint. A lifelong learner, Debi has achieved numerous certifications in national parenting and international coaching programs. She is a National Certified Trainer for Active Parenting Publishers. Believing diversity, equity, and inclusion begins at home, Debi and her husband of 30+years, utilized a strengths-based, coach-approach style of parenting to successfully launch more than one extraordinary child into the real-world. She shares her practical application experiences through humor and storytelling. For almost a quarter of a century, she has actively engaged with the Autism Society of America at the local, regional, and national levels. In today’s uncertain and complex world, Debi’s passion includes maximizing the potential of each child by supporting families, educators, and professionals to Connect | Communicate | Collaborate.